PRESS RELEASE: For the best part of 50 years the sight and sound of a Marshall valve amplifier has been the envy and dream of many a guitarist. 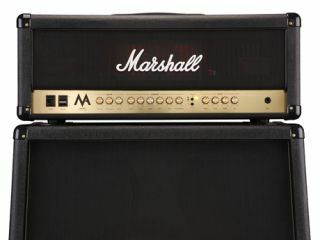 Legendary artists such as Slash, Jeff Beck and the late great Jimi Hendrix, plus rising stars like Ray Torro (My Chemical Romance) and Alexi Laiho (Children Of Bodom) continue to inspire with their raw talent and mighty valve-powered Marshall backlines. So when it comes to tone, it's clear that professional guitarists love valves. Now Marshall invites you to experience valve tone for yourself with our most accessible range of valve-driven guitar amplifiers ever - introducing the all-new, all-valve MA Series. With a classic ECC83/EL34 pre and power amp combination at its heart, the UK designed and engineered MA range is indeed built on solid pure-valve foundations. The MA Series provides both head and combo versions in either 100 Watt or 50 Watt outputs, all sharing the same trusty feature set. The dual channel design provides an abundance of tonal possibilities, while the straightforward front panel layout and individual EQ sections means achieving the sounds you want couldn't be simpler. With single coil pickups the Clean channel delivers clear bright notes, whilst switching to humbuckers and cranking the volume pot leads to natural signal break up, ideal for both cutting Indie-style rhythm and vintage rock riffing respectively. Hit the Channel selection switch and the uniquely voiced Overdrive channel lets you experience the full potential of Marshall valve power, from glorious bluesy crunch to hard driving rock and all points in-between. Engaging the Overdrive's Boost function provides extra gain for both pounding metal madness and fret-burning solos alike. and volume in your unboosted overdrive tone only, allowing the jump from say crunch to metal instantly, via either the front panel or the included 2-way footswitch. Used in this manner, the Crunch Balance has the ability to create a pseudo third channel from the Boost function, further increasing the MA Series' tonal spectrum and versatility. Additional tonal fine tuning is provided by a Master section consisting of Presence, Resonance and Reverb, and if pedals, FX boards and stomp boxes are your thing, then a serial FX loop is also included across the range. The 2x12" MA100C (UK RRP £663) and 1x12" MA50C (UK RRP £548) combos both contain the newly developed AX-75 speaker, custom-voiced to match the tone, feel and response of the whole MA Series perfectly. These speakers can also be found in the new full-sized M412A and M412B 4x12" speaker cabs. Finally, both the MA100H (UK RRP £599) and MA50H (UK RRP £480) heads feature semi-transparent baffles and illuminated chassis, allowing your valve-powered tone to literally shine. Whether you're finally realising a full Marshall stack dream, searching for a rugged gigging workhorse, looking for your first valve amplifier, or all three, the Marshall MA Series provides the answer. Now is the time to discover valve tone.